I have always been fascinated by the sparkling sensation I sense from viewing the strong greys of granite, especially in sunlight, they contrast so beautifully with the rich dark greys found in the shadow areas. For me, it’s a symphony in greys. I feel this painting, which is in the Oil Painters of America, Western Regional Juried Exhibition at the Mary Williams Fine Arts, Boulder CO, September 7- October 6, 2018, is the best example of one of my oils that shows these greys beautifully (both the light and dark, cool and warm greys). My use of the palette knife (from left to right): Cheson 808 made in Italy, Cheson 804 made in Italy, Cheson 814 made in Italy, No name on the knife from Morrilla, Italy (this is an old knife, for I think the Morrilla Co no longer exists). 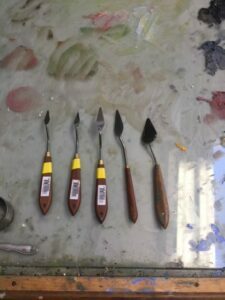 There are many different sizes and shapes of palette knives, if you decide to use them, you will have to experiment. Black and white make a neutral grey, while black and Naples yellow makes a beautiful string of warm greys…..Add Mars black to white and you will get a beautiful string of cool grays. 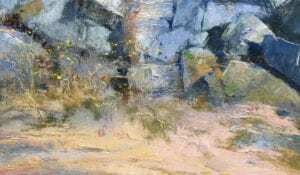 Certainly, there was a combination of brush and knife work to establish the rough texture of the granite rocks. I started the underpainting using a combination of Ultramarine Blue and Burnt Sienna transparently. I then focused on an area of the granite and painted it to practically finished. Then I painted from this area out till finish (painting from the center of interest out). I believe in contrast: Large shapes vs small shapes. Crisp edges as compared to lost edges. 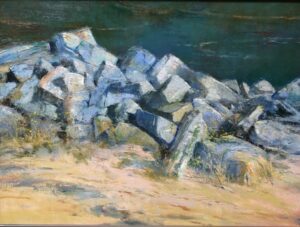 In this painting, I decided to contrast the most delicate of yellow flowers with the rugged texture of the granite. I used the palette knife (NOT THE BRUSH) for establishing the delicate yellow flurries found at the base in front of the greys of the granite. How is this accomplished? Good question! It might be a good idea not to try getting those delicate yellows while the greys of the granite are still wet! I suggest you wait until the under painting is completely dry. Then you can try it and if it doesn’t work, you can take it off without disturbing the greys. Unfortunately, there is no clear-cut answer to create such delicate yellows. The palette knife is applied by “feel”, it has a particular beauty all of its own. Just realize, it can be done, and if you wish to try it, it will take patience and practice.